S.M.R. Saia is a mother, gardener, author, and entrepreneur, whose professional experience in the book world includes owning a corporate book fair business and freelancing as a self-publishing coach. She has a B.A. in English from the University of Maryland, and an M.A. in Liberal Arts from St. John’s College in Annapolis, Maryland. For the past several years she has worked developing Common Core aligned Language Arts Worksheets for K – 12, using creative strategies to present, teach, and provide students with an opportunity to practice grade-appropriate Language Arts concepts and skills. The story conveys a good message to readers about friendship, helping, and doing favors for each other without expecting anything in return. The illustrations are charming and they make the characters come alive and the scenes vivid to readers. It is a good bedtime storybook and can be used for read aloud and interactive sessions in classrooms and school libraries because of the message it conveys. 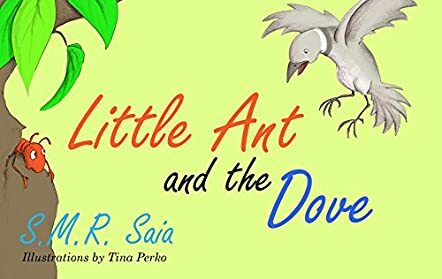 We never know when we will be in a position to help a friend and the author handles the message through the story of the Ant and the Dove deftly, with confidence and conviction. The Little Ant realizing his mistake and learning from it makes this story a must-read for all children.